Since I’ve got three updates for you today, I’m going to combine them all into one post. Let’s get started, shall we? While Disney’s Oz: The Great and Powerful is premiering today in theaters, Syfy will be premiering its own Oz knock-off tomorrow called Flying Monkeys (originally called Flying Terror). The story is about a girl living in Kansas whose new pet monkey turns out to be an evil, flying shapeshifter. I’m guessing that’s the only similarity to Oz, but we’ll have to see about that. Vincent plays the girl’s father, James. I’ve got to admit that I’m not crazy about seeing him take another role in a horror creature feature. I think he’s too talented an actor to play second fiddle to a monster (or in this case monsters). But I get that it’s work and sometimes you have to take what you can get until a better role comes along (like the role I’ve got for him in my movie 🙂 ). Regardless, I’m glad he’s working and that we’ll get a chance to see him on our screens again. Flying Monkeys airs tomorrow (Saturday, March 9) on Syfy at 9:00/8:00c. Be sure to check your local listings. Several years ago, I had the pleasure of seeing Eddie performing live on stage. It was such a treat! He’s an amazing actor, as well as a genuinely nice person. So I was happy to hear that Eddie is back on the stage again in a play called Benched. 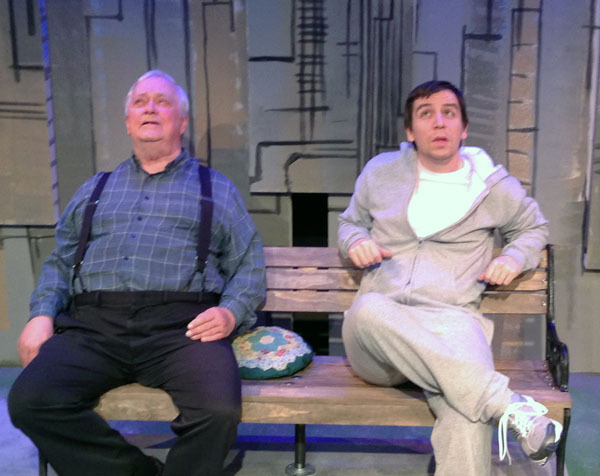 The play is about a disgruntled senior citizen named Max who “makes his way to his favorite bench in Central Park to consider what choices he may have left to make his life worth living. He discovers the bench occupied by a stranger who seems determined to disrupt and interfere with whatever plans he may have for himself.” The LA Stage Times has a nice write up about it. If you’re in the LA area, I highly recommend that you take some time to see this play. Watching Eddie perform live is never a disappointment. And his wife, Anita Khanzadian, is directing the play too, so you get the talents of both halves of this husband and wife team. Can you tell I’m a fan? Well, it’s not hard to be with these two. They are not only talented, but also just the nicest, sweetest couple. Benched is playing a limited run through March 24. You can see it every Friday and Saturday night at 8:00 p.m. and every Sunday at 3:00 p.m. It’s playing at the Avery Schreiber Theater, 11050 Magnolia Blvd., NoHo Arts District. You can purchase tickets at the Interact Theatre Company’s website or call 818-765-8732. For your convenience I’ve put Eddie’s performances as well as Vince’s movie on the Shoom Zone calendar. Try as I may, sometimes cast appearances escape my notice until after they are over. This is the case with Paul’s recent appearance in Vegas. Fortunately, you can watch the entire episode on the official Vegas website. But it may not be up for too much longer, so you might want to watch it while you can. The episode is called “Two of a Kind” and in it Paul plays Abe Silver, a Hollywood producer. This is the second time Paul has played a Hollywood producer; and the second time he has teamed up with fellow actor Michael Chiklis. Here’s a little quiz: Do you remember the name of the TV show in which Paul previously played a producer? 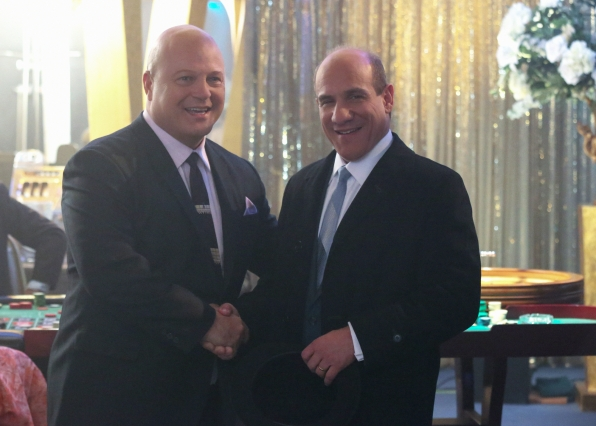 What TV movie has Paul appeared in with Michael Chiklis? Paul has signed up for a four-episode stint on this show so we’ll get to see more of Abe Silver in the future.